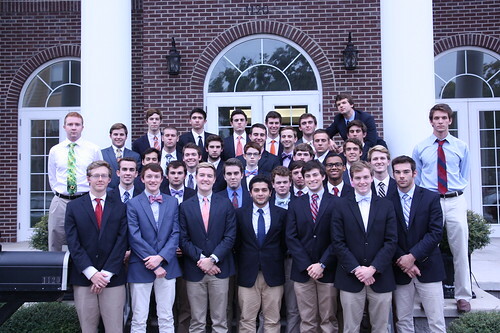 Congratulations on the fifty-one new pledges in the fall of 2018. In the Alpha Lamda pledge class consists of Alex Brocato, Greg Bouraoui, Connor Ruffin, Aiden Evans, Jacob Warchola, Jordan Allen, Kevin Cochran, Justin Lampel, Michael Contu, Nick Brandt, Hunter Noy, Morgan Scott, Scott Savage, Cade Siebecker, Tyler Lowman, Wesley Boyer, Zach Stevens, Pawan “P.J.” Badisa, Calvin Agar, Gabe Figueroa, Gage Bonjorn, Hunter Gaskin, John Hughs, Jose Camacho, Kyle Blackmon, Joe Maier, Nathan Fisher, Nick Meyer, Paul Gibbons, Ryder Roscigno, Sean Schelling, Benji, Joey Vicardi, Wyatt Walker, Beck Redmon, Christian Holland, Dangle, Chase Tolar, Hays Holm, Jack Kannon, Johnathan Toledo, Julien Waldbaum, Kyle Finkle, Adrian Mendoza, Nathan Smith, Noah Meyer, Reid Marlett, Sam Blau, Sean Walsh, Andrew Smiarowski, Vinny Savarino, and Zach Anderson. One of the biggest pledge classes in the history of Kappa Sigma. Hope you guys do great this semester! Welcome to the newest brothers of the Kappa Sigma Fraternity. Join us in congratulating Adam Lambert, Byron Fuller, Cameron Schaublin, Chris Childs, Cooper Brown, Daniel Cohen, Jack Bryan, Jake Lewis, Matt Pozca, Max Pierovich, Miguel Amador, Nick Maddron, Nick Manglaris, Nikita Buslov, Patrick Farese, Remy Suarez, Ryan Lebens, Nick Rubbo, Scott “Scooter” Sims, Shane Raudenbush, Zach Kish, Zack Jordan. Welcome into our ranks and welcome into the Twelfth Gate. A.E.K.D.B. This past fall, the following 31 men were granted membership within our Chapter. Please join us in congratulating Aaron Prohaska, Alex Esperanza, Andy Ma, Austin Kocher, Brad Massey, Brett Burnette, Brian Spivak, Christian DePersio, Cordell Vincent, Dalton Smith, Danny Galloza, David Berryman, Luke Newquist, Jacob Fredriksson, Harrison Long, Jake Bloom, Jake Hoelscher, Jeffrey Thompson, Kyle Nuckols, Tommy Barrett, Tyler Schwaeble, Max Gomez, Nick Marcantonio, Nick Skradski, Omar Bishr, Reed Quin, Ryan Hogan, Sean Adams, Sean Cole, Trey Banco, and Lucas Buckels. AEKDB. On March 21st, we were pleased to initiate the 27 members of the Alpha-Delta pledge class into our esteemed brotherhood. Congratulations to Stefan Dolinsky, Adam Napoletano, Andrew Llewellyn, Avery Hood, Nicholas Beardall, Brian Camilli, Bryan Guerrero, Cole Vaughan, Conner Young, Connor Knox, Dan Llanes, David Lopez, Evan Renz, Joe Sutherland, Fernando Barrosa, Greg Bogos, Jeff Lamothe, Kyle Telan, Max Ford, Nick D’Agostino, Hunter Tomko, Ryan David Schoel, Sam Parks, Trevor Mott, Tyler Brennan, Cole Sorenson, and Zach Sparks. A special congratulations to Pledge Master Daniel Boling and Pledge Educator Joe Dunham for all of their hard work.